Kitchener — There have been few periods in the history of popular music when song and politics converged more powerfully and with such endurance as the folk revival of the 1960s. Following in the footsteps of Paul Robeson, Leadbelly, Woody Guthrie and Pete Seeger and The Weavers, a generation of young artists wielded music as a means of political activism, social protest, justice and peace. Artists such as Harry Belafonte, Phil Ochs, Odetta, Buffy Sainte-Marie, Tom Paxton, Judy Collins, Joan Baez and Bob Dylan provided the soundtrack for a revolutionary decade of political and social turmoil, fuelled by a discredited war on distant shores, struggles for civil and human rights and accompanying racial riots, gender liberation and a trio of assassinations that fired a bullet into the heart of the hopes and dreams of the most powerful country on the planet. At the vanguard of this insurgent band of musical brothers and sisters was a trio who catapulted into international acclaim on the strength of their first names: Peter, Paul and Mary. 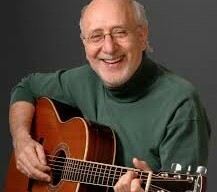 Formed in 1961 in New York City by super music manager Albert Grossman, Peter Yarrow, Noel ‘Paul’ Stookey and Mary Travers disbanded in 1970, produced their 25th Anniversary Concert in 1976 and reunited two years later. Peter, Paul & Mary not only participated in the Civil Rights Movement, their influence was acknowledged when they were invited to Washington in 1963 to sing for the historic march led by Martin Luther King, Jr., as well as the equally historic Selma-Montgomery march in 1965. As crucial as their political and social activism was to their art, Peter, Paul & Mary never compromised their musical integrity as songwriters, vocalists and instrumentalists. They performed mightily from stages; they never preached from pulpits or partisan political platforms. It was their music that made them important and influential and that protects their legacy. Don’t let the tiresome pledge programs aired during PBS membership drives fool you into dismissing Peter, Paul & Mary as yesterday’s news. The music they wrote and popularized on stages in concert halls and arenas, in the streets and at festivals and rallies and during marches around the world remain as urgently relevant as today’s headlines. It’s because of their music that the trio has succeeded in bringing the folk renaissance of the 1960s into the hearts and the homes of both an American and Canadian public. This backdrop makes Yarrow’s Folk Night at the Registry debut a significant occasion not only for folk fans but for music lovers who appreciate the history, tradition and legacy of popular music. For the first time the Registry Theatre, home of Folk Night, is partnering with Centre in the Square to present Yarrow’s November 21 concert at The Studio. The folk music legend is one of the highlights of the popular folk series’ 10th anniversary season. Yarrow will be joined by Mustard’s Retreat (David Tamulevich and Michael Hough), which debuted at Folk Night last season. A reception with Yarrow for a limited number of guests will be held prior to the concert, from 6 to 7 pm. Tickets for this ‘meet and greet’ are $30, in addition to a concert ticket ($45 advance/$50 at the door if available). An artist with activism still pulsating through his musical arteries, Yarrow’s gift for songwriting has produced some of the most beloved songs recorded by Peter, Paul & Mary including Puff The Magic Dragon, Day Is Done, The Great Mandala and Light One Candle. His creativity has always gone hand in hand with his commitment to social justice, equality and equity. And today he’s reaching out to a new generation with his music and advocacy. Since fighting on the front lines of the Civil Rights Movement, Yarrow has continued to commit his time, talent and voice to other critical causes: equal rights, peace, the environment, gender equality, homelessness, hospice care and education. Not content to rest on laurels, he has kept busy producing films, television specials, DVDs, books, concerts and festivals. In 1999 he founded the non-profit Operation Respect, a free program of music and video, along with curricular materials, designed to establish a safe, compassionate and nurturing environment in schools and camps across America. As a member of the renowned folk trio, Yarrow has earned numerous gold and platinum albums, won multiple Grammy Awards and was nominated for several more. Let’s end where all discussions of Peter Yarrow should begin — with Puff the Magic Dragon. Has the story of life ever been expressed so simply, so eloquently, so magically? In seven four-lined verses Yarrow masterfully captures the mystery of life — a ship in a bottle tossed on the sea of eternity. It spans the wonder of child innocence and the sorrow of adult experience, tainted by the inevitability of mutability and mortality. It’s the human story set to an enchanting melody, transcending time and place and bridging the cradle and the grave. It’s folk music at its purest and finest, enough to paste a smile on the angelic face of that sane visionary poet William Blake who saw a world in a grain of sand and heaven in a wild flower.